History and Information about Canfield Ohio’s Greier Ag Center, Inc.
Greier Ag Center, Inc., located at 9585 Columbiana-Canfield Road (State Route 46) in Canfield, Ohio was established in 1973 by Gerald and Diana Greier. Greier Ag Center offers a full line of crop seeds, liquid and dry fertilizer, soil testing and agronomic support. Gerald and Diana began selling seed and fertilizer from their kitchen table on the family farm in Austintown, Ohio. Back then they would unload entire semi loads of fertilizer by hand! In 1981, they moved to Green Township and in 1990 to the current location in Canfield. At the Green Township location, they expanded the line of products sold to seed, bagged fertilizer, and chemicals. When they moved to the Canfield location, they also added bulk fertilizer and bulk chemicals to the line-up. In 2000, Gerald passed away from complications to a long battle with cancer. Diana and a dedicated team of employees kept the business booming while Wayne, Gerald and Diana’s son, studied crop production at The Ohio State University’s Agricultural Technical Institute. When Wayne came home from college, he was young, fresh and excited about farming the family farm and working the family business. In 2004, Wayne married Sara, a long time childhood friend. Together, Wayne and Sara slowly began to add more product lines and offerings to Greier Ag Center’s customers. In 2007, they built a state-of-the-art drive through bulk & packaged chemical facility. 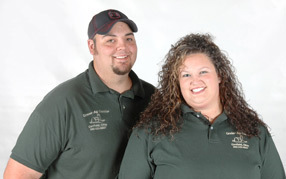 In 2008, Wayne and Sara bought the family business from Diana and a brand new Country Store was opened in April. Wayne and Sara like to call it “Greier Ag Center Country Store”.